The Eventide H8000 Ultra-Harmonizer's Reverb programs have been used in studios all over the world and heard on countless hit records for many years now. 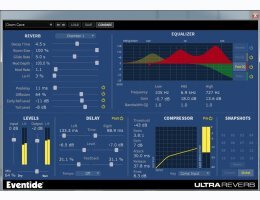 UltraReverb Native features an elegant graphic interface with a complete range of editing parameters, Its unsurpassed sonic flexibility includes all the usual controls associated with reverb plus the addition of a full-featured compressor. Now the classic reverb sound of the H8000 Ultra-Harmonizer can be yours at a far more reasonable price.